Apostille or Authentication – Why and What’s the difference? Apostille or Authentication why am I being asked to do it and what’s the difference are questions that we hear often from our clients here at Authentication Legalization Services Canada (ALSC). To help explain Canadian documents being used outside the country, for personal or business affairs, must go through the two step process of authentication of documents and legalization to make them valid for use internationally. The process of authentication and legalization must also be followed in order for a Canadian document to be accepted as the equivalent to an Apostille Seal. We talk more about this below as many of our clients have been asked to get one for their Canadian document only to discover that it’s not possible. The Authentication and Legalization process applies to a Canadian Birth Certificate, Marriage Certificate, Degree, Police Check, Power of Attorney, Certificate of Incorporation or Certificate of Origin to name a few official documents that maybe used in a foreign country. As Canada’s first service provider Authentication Legalization Services Canada has been helping people and corporations for 25 years authenticate and legalize all types of documents for use internationally, feel free to speak to one of our friendly specialists about yours. Outside of Canada another commonly used method to have a document validated for use internationally is to get an Apostille stamp. This is the process used when both countries have signed the Hague Convention Agreement. If you want to find out more about the Hague Convention agreement see more about it here. It outlines the process and helps explains that it is a new method adopted by a group of countries to validate documents for use internationally, although Canada is still not a member. Since Canada has not signed the Hague Convention Agreement it does not issue Apostille Certificates. Instead the Canadian government uses the older internationally recognized equivalent that starts with the first step of Authentication of Documents at the Department of Global Affairs Canada located near our ALSC Ottawa national headquarters. The second step of document legalization takes place at the embassy of the country in which the document will be used which once again most are located here in Ottawa close to our headquarters which gives our clients the benefit of quicker processing. The two steps of authentication and legalization to validate a Canadian document internationally still applies when the country where the document will be used has signed the Hague Convention agreement. Here are some of the countries who use the Apostille process and may specifically ask you to get one for your Canadian document. These countries include Albania, Argentina, Austria, Brazil, Bulgaria, Chile, Colombia, Costa Rica, Cyprus, Czech Republic, Dominican Republic, Ecuador, El Salvador, Germany, Greece, Honduras, Hong Kong, India, Ireland, Israel, Italy, Kazakhstan, Mauritius, Mexico, Netherlands, Nicaragua, Panama, Peru, Poland, Romania, Russia, Serbia, Spain, Switzerland, Turkey, Ukraine, United Kingdom, United States and Venezuela. It’s important to remember that if you have been asked to get an Apostille for your Canadian document the two steps of authentication and legalization must be completed in order for it to be accepted as the equivalent in one of the countries I just mentioned. Now that we have covered what an Apostille is and who uses them, let’s talk about the authentication of documents in Canada the first step in having your Canadian document accepted internationally. We authenticate all types of documents at Global Affairs Canada Authentication Services Section. Below is a list of some of the more common ones. If you don’t see your document listed below speak with one our friendly specialists they will be able to provide you more information. There are also some great articles that explain more about the documents below and what is required to have them authenticated at Global Affairs Canada and legalized at the embassy see our Quick & Easy Verification section on our homepage. Global Affairs Canada Authentication Services Section in Ottawa is responsible for the authentication of documents for use in a foreign country. Once they verify the official signature on your document is valid by checking in their registry, they affix their stamp, seal and signature. Before doing this there are certain requirements that apply to the document, but not to worry our consultation guarantees document authentication. If you want to confirm your document is ready to be authenticated use our Quick & Easy Verification on our homepage then follow the ALSC 5 Easy Steps. Currently Global Affairs Canada takes 20 business days using their mail in service to authenticate a document but using Authentication Legalization Services Canada can shorten this to as quick as 1 business day, another benefit of choosing our authentication of documents service. 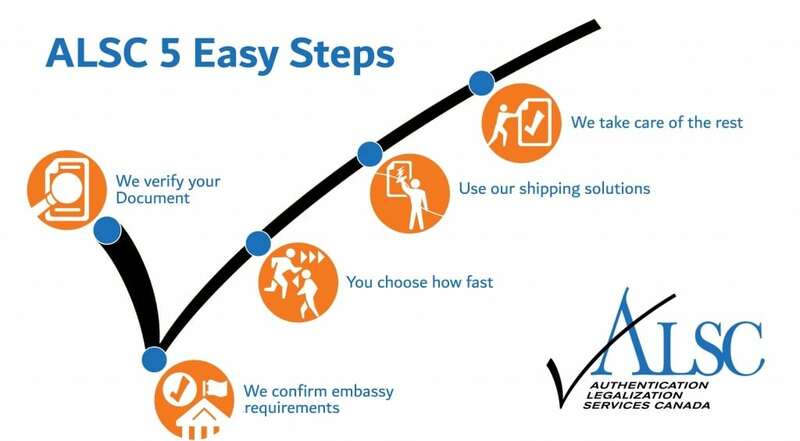 We Make Apostille, Authentication and Legalization Easy!